The jaw-dropping critical and commercial success of the original Star Wars (or Star Wars Episode IV: A New Hope if you’re a purist, or George Lucas), a film that was being written off as a flop before its release even by the very studio that financed it, sounded a wake-up to the industry that could not be denied. Science-fiction cinema was no longer going to be treated as cheap, disposable schlock Hollywood execs ordered green-lit a few times a year to pad out their coffers. Despite the existence of the rare genre feature that made a significant cultural impact, be it The Day the Earth Stood Still or MGM’s unbeatable two-fer of Forbidden Planet and 2001: A Space Odyssey, sci-fi was seen as pure kids’ stuff. Execs at the major studios found them to be not exactly worth granting the kind of exorbitant budgets normally set aside for the splashy historical costume epics and grand-scale musicals that were still being made even though they have long been proven to be relics of a much different age. The moment Star Wars opened to record-obliterating box office and became an instant pop culture phenomenon in every corner of the globe, that all changed. It was a harsh lesson that Hollywood had a long time coming, but it would take them even longer to allow for the lesson to fully sink in. For fans of silver screen sci-fi, 1979 was quite a year. I was born on March 10 of that year (one day after actor Oscar Isaac), and two months later, Ridley Scott’s Alien premiered and blew the minds of audiences everywhere. I was too young to remember my first Christmas, but at the time it happened two of the splashiest space spectacles ever conceived by the major studios were screening to decidedly mixed receptions. Paramount’s mega-expensive (for its time), oft-delayed Star Trek: The Motion Picture went into theaters on December 7 (the 38th anniversary of the bombing of Pearl Harbor, oddly enough), having practically completed post-production mere days earlier, and became the season’s reigning blockbuster. 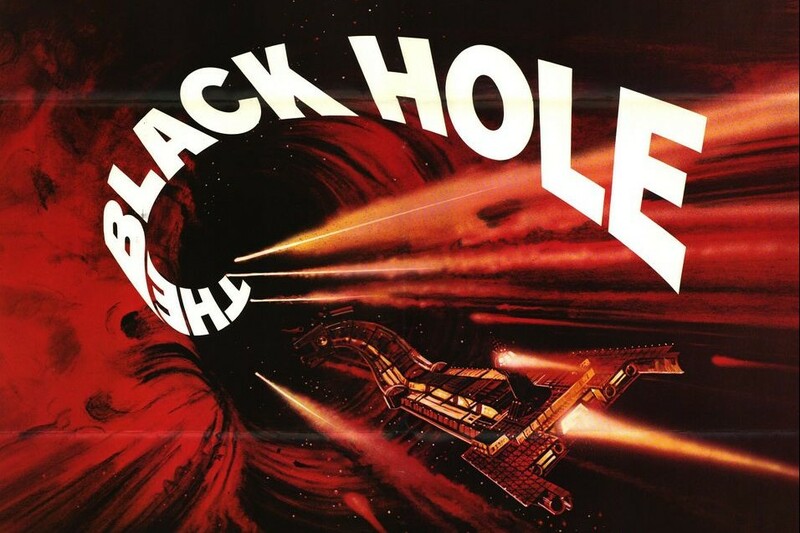 Two weeks later, Walt Disney Pictures unveiled their own elaborate attempt to cash in on the post-Star Wars demand for effects-driven screen excitement, the $20 million extravaganza The Black Hole. At the time it was the studio’s most expensive release, one they backed up with a $6 advertising campaign that included a massive merchandising unheralded for a live-action Disney film. Toys were produced, lunchboxes manufactured, and even a few books made it into stores. The great Alan Dean Foster wrote the official novelization, and the legendary Jack Kirby provided the artwork for a comic adaptation. The studio even went the extra mile of striking some 70mm prints for special exhibitions to showcase the magisterial cinematography of the late Frank V. Phillips (Darker Than Amber) in what is perhaps the most impressive feature film he shot in his entire career. 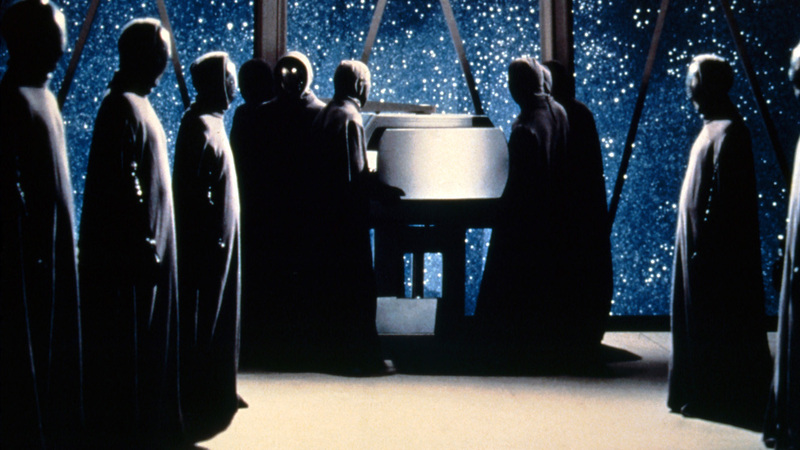 Though Disney initially approached the young FX wizards at Industrial Light and Magic about renting out some of the revolutionary technology that helped to realize Lucas’ vision of outer space dogfights and galactic bases the size of moons, the entire production was eventually created in-house. The effects were created through a combination of old school techniques and new methods developed for The Black Hole. Peter Ellenshaw, one of the studio’s finest FX artists (his credits include 20,000 Leagues Under the Sea and The Love Bug among many others), was brought out a decade-long retirement to create the miniature effects, while his son Harrison Ellenshaw (a veteran of the Star Wars crew who had also plied his chosen trade for several notable Disney productions) was tasked with the sumptuous and often unnerving matte paintings that have become one of the film’s visual hallmarks. Initially hired to direct was the respectable British filmmaker John Hough, who had achieved significant success at Disney with the Witch Mountain movies, but he bowed out due to a scheduling conflict and was replaced by Gary Nelson. A veteran of television directing with scant theatrical credits to his name, Nelson was well-admired by Disney execs thanks to the six episodes of Walt Disney’s Wonderful World of Color he directed, not to mention the body switch farce Freaky Friday that featured a young Jodie Foster (the year after she broke through in Scorsese’s Taxi Driver) and was a pleasant little hit for the studio. Jeb Rosebrook, best known for his work on Sam Peckinpah’s Junior Bonner, co-wrote the screenplay with longtime television scribe Gerry Day from a story Rosebrook concocted with Bob Barbash (another TV writing vet) and Richard H. Landau (The Quatermass Xperiment). The first Star Wars managed to strike more than a few nerves on its release with a young audience that could tell when the old guard of cinema was pandering to their desires for a new kind of screen excitement while simultaneously employing tired storytelling tropes that had long been considered antiquated. Lucas’ film was brought to life through the skills of a cast and crew primarily comprised of people in their 20’s and early 30’s – as opposed to people born in the 20’s and early 30’s – and their youthful energy and enthusiasm gave Star Wars a refreshing vitality the likes of which were rarely seen in filmmaking. It was one of the defining celluloid statements of a decade that was birthed by the trailblazing breakthrough success of Easy Rider and the rise of the “New Hollywood” that gave the world some of the most important cinematic visionaries the art form had ever seen. Features that followed including Two-Lane Blacktop, Mean Streets, The Exorcist, and Apocalypse Now were made by enterprising film school students who had been raised on the classic films of generations past. They had respect for the old way of doing things, but they also realized the film industry was about to experience a sea change not witnessed since the dawn of cinema. There was an untapped younger audience out there being summarily ignored by the current studio system that still insisted on cramming bloated, outdated westerns and musicals down their throats and then blaming those damn kids for their crushing failure at the box office when everyone pretty much knew that those movies were not being made to appeal to them, but to their parents. The Black Hole didn’t feel like the work of fringe outlaws wanting nothing more than to break down the rigidly conservative structure of the old Hollywood and usher in a dazzling new age of cinematic adventure. It was the product of that very system from the start, wanting to capture a sizable chunk of that young audience by giving them the colorful visual effects, robots, and spaceships they craved. They also wanted to cast veteran actors whose careers had been forged and kept alive by appearing in studio-funded features and saw the film as just another day at the office, a goofy diversion to put some money in the bank and keep food on their tables until something better came along. There’s no question that Disney’s $20 million investment was well-spent; beginning with an opening credits sequence that incorporated the longest use of computer graphics seen to date on screen and was underscored by a soundtrack composed by John Barry that conveyed the film’s mystery and awe beautifully, it was clear that every dollar spent to make The Black Hole was going to be right there up on the wide theater screen in vibrant Technicolor supported by the aural majesty of Dolby Stereo. The studio didn’t skimp on the visual wonders. In this day and age where digital effects continue to dominate, the hand-crafted models, miniatures, and mattes created by the Ellenshaws and their beyond capable team remain stunning. While the technical craft on display may be expensive and state-of-the-art, the narrative recalls the pulp sci-fi potboilers that used to be pumped out by independent operators and the B-arms of the majors for a few hundred thousand dollars in the 50’s and 60’s. A spaceship crew on a long-term exploration journey commanded by the all-business Captain Dan Holland (Robert Forster) and comprised of psychic-powered scientist Dr. Kate McCrae (Yvette Mimieux), her brusque colleague Dr. Alex Durant (Anthony Perkins), grouchy journalist Harry Booth (Ernest Borgnine), and fresh-faced Lieutenant Charlie Pizer (Joseph Bottoms) comes across the long-lost advanced craft USS Cygnus hovering at the edge of a black hole. Upon boarding, the only human presence left on the ship is Dr. Hans Reinhardt (Maximillian Schell), the brilliant commander of the Cygnus whose reputation is known to Holland and every member of his crew, especially Durant, who appears a bit too enamored of Reinhardt and his work. The Cygnus used to have a full crew of human beings (among them, Kate’s father), but according to Reinhardt, they all took off for an unknown destination twenty years ago once their conditions began to grow unstable. The doctor has since replaced them with an army of servile androids, silent and imposing as wraiths with mirrored masks to conceal each visage. Eventually it becomes apparent to Holland and the others that Reinhardt has gone insane and is prepared to take his scientific research to the ultimate level by piloting his vessel into the black hole in a crazed attempt to travel to the farthest reaches of the universe. Only Durant is interested in coming along for the ride to end them all, while Holland, McCrae, and the rest of the crew do their best to get off the Cygnus before it gets sucked down the galaxy’s drain. Unfortunately for our intrepid heroes, they’re all about to share in Reinhardt’s obsession whether they like it or not. The Black Hole is the very definition of an effects-driven event film, one where the technical artistry can’t help but overwhelm the story and performances. This isn’t just because the effects and design work are first-rate, but rather because the other creative elements in front of the camera never once threaten to rise above a basic level of competence. The Rosebrook/Day script and acting from a well-chosen cast of old pros serve the visuals when it’s supposed to be the exact opposite. 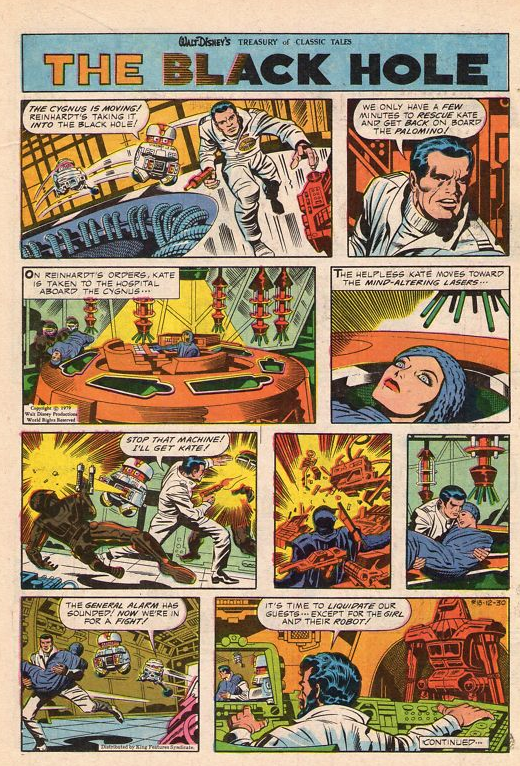 Whereas the original (and I use that term quite loosely) Star Wars was a loving mish-mash of Flash Gordon serials and Akira Kurosawa’s samurai epics, The Black Hole‘s narrative is obviously indebted to the aforementioned Forbidden Planet as well as the novels of Joseph Conrad, in particular Heart of Darkness. Reinhardt is the Kurtz figure without question; he journeyed upriver and lost every trace of the man he was along the way, except he traveled a river that goes on forever and rewards your devotion to unlock its secrets by devouring you completely. That could have made for a modern classic of cinematic sci-fi, but the rest of the story is dominated by one-dimensional stereotypes jockeying for camera time while dealing with wheezing plot devices that fans of the genre have encountered countless times. Each character is defined by what they do, not who they are, and despite having talented actors at his disposal, director Nelson appears merely content to have them hit their marks, say their hackneyed dialogue, and move on to the next scene. That doesn’t mean The Black Hole is an entertaining movie, because it most certainly is, but with a little more care and imagination it could have stood for all time in the annals of speculative science fiction films. The thought-provoking aspects of the script are few and far between, and Nelson virtually drowns them in flashy laser battles and ear-shattering explosions. Though fun to watch, they add almost nothing to the story. The film sets us up for a voyage into uncharted regions of the universe and the human psyche and dispenses with those fascinating possibilities for one scene after another where Reinhardt’s robot army is blasted into scrap parts by our bland heroes. What little personality exists in each character is provided by the actor playing them. Forster, the great B-movie tough guy who grew into a terrific character actor thanks to his role as the aging bail bondsman Max Cherry in 1997’s Jackie Brown (Quentin Tarantino’s finest film in my opinion), is on top form in a rare leading role in a big-budget studio feature. His Captain Holland is a stone-faced man who has the unquestioning respect of his crew and can see the horrors aboard the Cygnus coming from a mile away. Borgnine doesn’t understand what’s going on and chooses not to conceal it, and Perkins is perfectly unsettling. Schell is a good villain with a motivation far more complex than sci-fi baddies are typically afforded. Only Mimieux, with her flat line readings, and Bottoms, with his emotionless face and whiny demeanor, drag the rest of the cast down every time they’re onscreen. It’s ironic then that’s the deepest and most heartfelt human relationship is between two robots. There’s V.I.N.C.E.N.T., the helpful little bot and unofficial mascot of Holland’s crew whose vocals are provided by Roddy McDowall, and an outdated but noble droid of the same model named B.O.B., voiced by Slim Pickens. Both actors went uncredited in the final film, but their voices are so unmistakable that not even some post-production tinkering could make them sound any different. Though McDowall and Pickens possibly recorded their dialogue separately long after the film wrapped, the humanity they bring to these robots who strike up a friendship in the midst of the adventure is oddly endearing. It’s somewhat magical and amusing how they were able to create a warm chemistry between V.I.N.C.E.N.T. and B.O.B., but how they manage to do so is beyond me. Lloyd Ahern, future cinematographer for Walter Hill (Trespass, Undisputed, the pilot episode of Deadwood), worked on The Black Hole as a camera operator. His name immediately stuck out in the end credits for me. But the most interesting contributor to the film’s effects is Tom McLoughlin, who made use of his skills as a mime to coordinate the sentry robots of the Cygnus and even appeared in front of the camera as their leader Captain S.T.A.R. McLoughlin would go on to become a director working mostly in television, but horror fans know him best for Friday the 13th Part VI: Jason Lives, the sequel that introduced meta humor and fright flick in-jokes to the world of Jason Voorhees. The Black Hole wants so badly to be a stylish and thrilling amalgamation of Star Wars and 2001: A Space Odyssey that it’s willing to go completely weird in its final minutes. It’s that climatic sequence that has helped the film to build a modest cult following in the thirty-six years since it was released theatrically. This is also where some of the effects crew’s finest creations are presented to us in the form of a disorienting, yet astounding vision of what could very well be the absolute end of all things. For our heroes, it ends with a note of optimism as their adventure into the unknown could just be beginning (imagine where a sequel could have gone), but for Reinhardt, it results in the realization of his greatest desire in ways he never considered – or wanted. Much like the mind-blowing conclusion to 2001, the audience is left to ponder what exactly has happened instead of the filmmakers spelling everything out for them. The Black Hole is currently streaming in gorgeous 1080p high-definition on Amazon Instant Video. I hope Disney has a Blu-ray in the works for this undeservedly overlooked cult classic. This entry was posted in Film, Filmmaking, History, Reviews, Science Fiction. Bookmark the permalink.